It’s the cradle of civilization. It’s where we all came from, whether recently or long, long ago. It’s the birthplace of three great sister religions, and the site of many a sibling squabble perpetrated by each in turn. And those are no alternative facts. The Middle East has always been a region in turmoil, but great art rarely arises from a place of peace and complacency. And while this part of the world is quite distant from European classical traditions, there have been many composers who have sought to unite the music of the East and West in ways that express the humanity we share in common. Indeed, we are truly more alike than we are different. 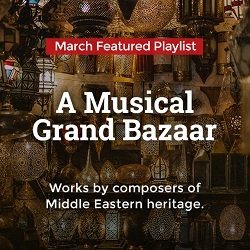 Join us as we learn more about each other in a trek through A Musical Grand Bazaar. 1. Cemal Reşit Rey – Scènes turques: No. 4. Yürük Zeybek Havası – Cemal Reşit Rey was a member of The Turkish Five, a group of composers in the first half of the twentieth century who sought to blend Western musical traditions with their own cultural heritage. The work selected here is from a set of orchestral pieces based on Anatolian folk tunes. 2. Ulvi Cemal Erkin – Symphony No. 2: III. Allegro – Alla Köçekçe – Another member of The Turkish Five, Erkin also incorporated Turkish folk melodies and modes throughout his oeuvre. The finale to his Symphony No. 2 includes music inspired by the köçeks, which were male traditional dancers who performed in women’s clothing at a point in Turkish history when male and female entertainment were kept separate. 3. Arash Safaian – Concerto No. 3 for Piano and Vibraphone, “Fuge Like a Passion”: II. Little G – Composer Arash Safaian was born in Iran, but much of his life has been spent in Germany. This selection is taken from a set of five concertos for piano and vibraphone that are based upon works by Johann Sebastian Bach. 4. Mohammed Fairouz – Tahrir – Mohammed Fairouz is a young American composer of Palestinian and Emirati descent who composed this piece for clarinet and orchestra in commemoration of the 2011 Egyptian Revolution, the epicenter of which was downtown Cairo’s Tahrir Square. “Tahrir” is an Arabic word that fittingly means “liberation” or “release”. As is typical of Fairouz’s music, this work communicates the tangle of strong emotions surrounding the Arab world. 5. Sayed Darwish – Muwashah Ya Bahgit El Rouh – Though Darwish was only thirty-one in 1923 when he died of a heart attack, he retains a reputation as Egypt’s greatest composer. He was incredibly prolific, too; among his many works were twenty-six operettas, two hundred sixty songs, and the melody of the Egyptian national anthem. 6. Aziz El-Shawan – Egyptian Folk Dance – El-Shawan was a prominent composer from Egypt who spent time studying in Russia. It was Armenian composer Aram Khachaturian who heard his music and invited him to Moscow to study. While there he was in contact with other prominent composers from Russian and Central Asia, including Dmitri Shostakovich and Azerbaijani composers Uzeyir Hadjibekov, Kara Karayev, and Fikret Amirov. 7. Behzad Ranjbaran – Moto Perpetuo – Behzad Ranjbaran is a Persian composer born in Tehran, Iran. He has been on the faculty at the Juilliard School for over twenty-five years, and he has composed for such classical stars as Joshua Bell, Yo-Yo Ma, and Renée Fleming. His music displays the influence of Iranian music, as well as that of other non-Western cultures. 8. Avner Dorman – Piano Concerto in A Major: I. Allegro – Israeli composer Avner Dorman burst quickly out the gate in his career, winning a number of prestigious awards before reaching the age of 30. He composed his Piano Concerto in A Major at the age of nineteen, and it was his first foray into neo-Baroque composition. One can certainly hear the influence of Bach and Vivaldi in this work. 9. Bechara El-Khoury – Danse (Dance of the Eagles) – El-Khoury is a composer from Lebanon who in 1979 moved to Paris to study Western composition. He eventually earned French citizenship, and he’s since enjoyed a busy career as composer, pianist, choirmaster, conductor, and poet. The work selected here was composed at the age of twenty-three, shortly after he moved to France. 10. Georges Baz – Esquisses: VII. Une soirée libanaise – Like many artists from Lebanon, Baz was influenced strongly by the culture of France, the colonial power from whom Lebanon gained its independence in 1943. Baz maintained a dual career as both music professor and head of the central bank of Lebanon. Selected here is the last in a set of piano miniatures, and it depicts a Lebanese street festival. 11. Wadih El Safi – Anta Ya Man’amarta-l-barhr – El Safi was a singer, songwriter, composer, and actor who enjoyed a lengthy career as a cultural icon sometimes called the “Voice of Lebanon”. His career was launched when he won a singing competition at the age of seventeen. He would go on to enjoy a lengthy and successful career that took him all over the world. 12. Kayhan Kalhor – Gallop of a Thousand Horses – Kayhan Kalhor is a Kurdish musician from Iran who now resides in the United States. He plays a number of traditional Iranian and Kurdish instruments, though the Iranian violin is his specialty. He has collaborated with such prominent artists as the Kronos Quartet and, as included here, Yo-Yo Ma’s Silk Road Ensemble. 13. Le Trio Joubran – Le Dernier Vol – Le Trio Joubran is a group comprised of brothers Samir, Wissam, and Adnan Joubran. All three play the oud, and their music is based upon the traditional music of Palestine, where they are from. Currently they divide their time between Palestine and Paris. 14. Elif Ebru Sakar – Wind Touch – A native of Mersin, Turkey, Elif Ebru Sakar was only eighteen years old when Wind Touch (2012) was commissioned by the Meininger Trio, making her the youngest Turkish composer to ever be commissioned by a European artist. 15. Afshin Jaberi – Piano Sonata No. 3, “The Bedouin”: I. Andante – Allegro – Afshin Jaberi is an Iranian composer who was born in Bahrain and raised in Qatar. His Piano Sonata No. 3 was inspired by remote Bedouin tribes, with the first movement using a Bedouin melody to depict the remote deserts this culture calls home. 16. Kamran İnce – Symphony No. 2, “Fall of Constantinople”: II. Hagia Sophia – Turkish-American composer Kamran İnce’s Symphony No. 2 depicts the fall of the Byzantine capital in 1453 at the hands of Mehmet the Conqueror. The second movement is a musical picture of the famous landmark Hagia Sophia, which after Constantinople's fall was converted from an Eastern Orthodox church to an Ottoman mosque. 17. Solhi Al-Wadi – Piano Trio: II. Burlesque: Allegro – Al-Wadi was born in Baghdad, Iraq, but he spent most of his life in Damascus, Syria. He was a tireless champion for the arts in Syria, and it was through his tireless negotiations with the Syrian Ministry of Culture that an institute of higher education in music, theater, and dance was finally established in Damascus in 1990. It was also partly through his influence that the Damascus Opera House was opened in 2004. 18. Fouzieh Majd – Dialogue 88: II. --- – Fouzieh Majd is a Persian ethnomusicologist and composer who currently resides in Tehran. She is noted for her efforts to gather and preserve Persian folk songs. She studied in England and France, and her music includes works for piano, string orchestra, and film. 19. Tsippi Fleischer – Symphony No. 1, “Salt Crystals” – Israeli composer Tsippi Fleischer grew up in a mixed Jewish-Arab environment in Haifa. She has pursued degrees in music, Middle Eastern history, Hebrew, and Arabic. In her music she seeks to combine elements of both Jewish and Arabic music. 20. Dia Succari – Lu Nuit du Destin – Dia Succari was born in Aleppo, Syria, and went to France to study music when he was thirteen. He studied the Arabic maqam modes and rhythms extensively and found ways to incorporate them into his compositions, which were influenced greatly by Debussy and Ravel.